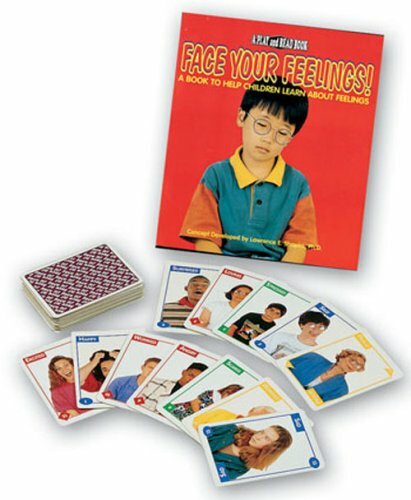 Kit contains two copies of the book, Face Your Feelings (concept developed by Lawrence E. Shapiro). Book has the name of an emotion printed on one page with a sentence that explains the reason for the emotion. The opposite page has a photograph showing the facial expression that demonstrates the emotion. Kit also includes Face It! (c. 1998)-- a deck of 52 cards with two jokers which can be used to play 10 card games to learn about feelings. Instead of suits, the cards are divided into four age groups identified by color: children (green), teens (blue), adults (red), and older adults (gold). Each number represents one of thirteen different feelings.